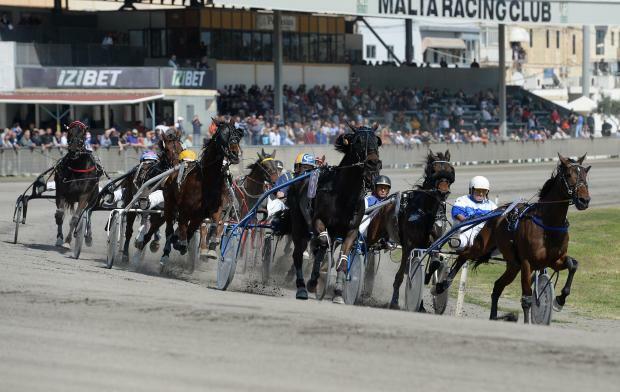 The 13th meeting of the year, made up of nine races all for trotters was held yesterday afternoon at the Marsa Racetrack. During this programme resumed also the Krafft championship for class Silver trotters with five heats on a short distance of 2140m. From these heats, twenty horses made it to the quarter final stage. In the first heat, Vic For Ever (Kevin Sciberras) started to increase its speed from the outside with a lap to go. This French trotter took the lead when the front horses turned for their final straight and sealed its second win in a row, easily by a length and a half from Nobile Edel (Mario Fenech) and Va Tout Steed (Noel Baldacchino). Tinus Moseby (Marco Refalo) ended in fourth place. Wellington (Nathaniel Barbara) sprinted well during the last 400m of the second class Silver heat. Barbara’s trotter registered its second win of the year by half length from Staro Evergreen (Marco Tanti) and Sharif America (Matthew Sammut). Evisir (Redent Magro) also obtained a good place. Swedish Capac Boko (Clint Vassallo) was unchallenged for most of the 2140m distance of the third heat from the same championship. This trotter managed to take its first win of the season. Faro Sue Heikant (Julian Farrugia), Duc d’Haufor (Redent Magro) and Frans G (Noel Baldacchino) also made it to the next stage. In the fourth heat another Swedish horse, Sitka Rod (Tony Demanuele) led all the way. This trotter crossed the finishing post first, however due to interference in the final metres the win was awarded to second placed Leap Day Credit of Chris Vassallo. The latter took its second win in a row. Ibiri (Mario Falzon) and Roi Des Couperies (Paul Galea) ended respectively in third and fourth. Hallas Judex (Charles Magro) was also unchallenged during the 2140m distance of the fifth and last heat. This Swedish ten year old trotter gained its second consecutive win from Breidabliks G.T. (Rodney Gatt) and New York Broline (Chris Grech). Ange Du Porto (Clint Vassallo) was the last horse to qualify for the quarter finals.